UNDATED - Based on July 1 conditions, South Dakota's 2017 winter wheat production is forecast at 28.0 million bushels, down 56 percent from last year's crop according to the USDA, National Agricultural Statistics Service. Average yield is forecast at 43.0 bushels per acre, down 15.0 bushels from 2016. 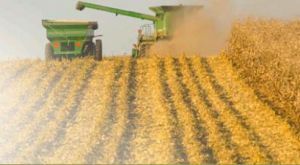 Area to be harvested for grain is estimated at 650 thousand acres, down 41 percent from a year ago. Spring wheat crop is forecast at 32.0 million bushels, down 32 percent from last year. Average yield is forecast at 34.0 bushels per acre, down 11.0 bushels from 2016. Area to be harvested for grain is estimated at 940 thousand acres, down 10 percent from a year ago. Oat production is forecast at 6.30 million bushels, down 30 percent from last year. Average yield is forecast at 63.0 bushels per acre, down 19.0 bushels from 2016. Area to be harvested for grain is estimated at 100 thousand acres, down 9 percent from a year ago. Nationally, winter wheat production is forecast at 1.28 billion bushels, up 2 percent from the June 1 forecast but down 23 percent from 2016. Based on July 1 conditions, the United States yield is forecast at 49.7 bushels per acre, up 0.8 bushel from last month, but down 5.6 bushels from last year. If realized, this will be the second highest yield on record for the United States, behind only 2016.